An 11-year-old girl searches for a missing rare book from her grandmother's (Holland Taylor) library and tries to understand why her family is fractured the way it is during a memorable summer at an isolated New Mexico adobe. While her mother (Kelly Lynch), like astronaut Michael Collins, goes to the dark side of the moon for a leukemia treatment, Ella must journey on her own to the strange moon of her grandmother's world. Ella's father, (Sean Patrick Flanery) orbits his daughter, as Ella befriends Miguel and Rosie to find acceptance of her mother's fate. Emotional connections are reshaped, and the music of Patrick Neil Doyle helps tell this unusual story. 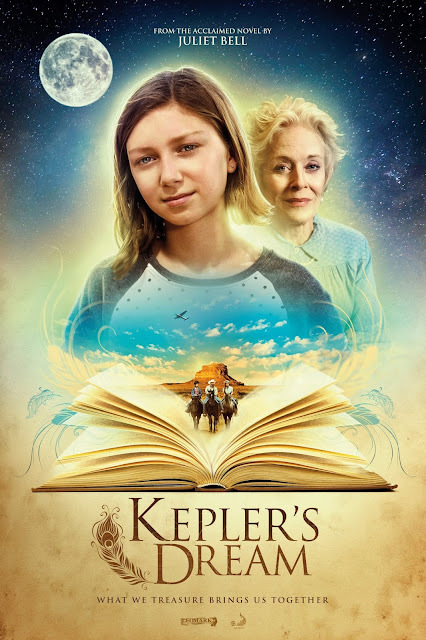 Today I had the chance to speak with Kelly Lynch about her role in KEPLER'S DREAM. We also discuss the documentary film THE OILER HOUSE, the architecture of John Lautner and Richard Neutra, how an early trauma propelled Kelly into her acting career, MAGIC CITY, MR. MERCEDES, THE JACKET, DRUGSTORE COWBOY, and of course how Mitch Glazer is more of a ladies man than Warren Beaty. It was an absolute pleasure to chat with Kelly, her film KEPLER'S DREAM will be in theatres December 1st. Press play on the embedded player below to listen to my conversation with Kelly Lynch.